City of New Bedford encourage you to see if solar energy makes sense for you! 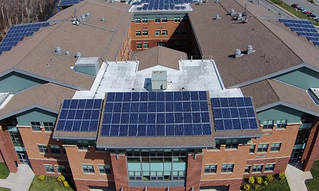 The City of New Bedford has developed 14.25 MW of installed solar. This activity has many benefits for the City. It has been recognized by organizations such as the Wall Street Journal as the #1 city in the continental US in terms of solar energy produced per capita. Solar now offsets over 65% of municipal electricity use. And from the financial perspective, the City is estimated to save $25 million over the next 20 years on its energy costs. New Bedford has become a national leader. Solar is not only saving the municipal activities of government but is also saving our residents money. As of June 2015, over 142 solar systems have been installed on residential roofs, saving our residents an annual aggregate amount of $64,000. We encourage you to explore solar today!